ABOVE: A free bus arrives at the Panorama shopping center in Marghera. For serious shopping, most Venetians bypass the likes of Prada, Missoni, and Gucci. They head for local supermarkets such as Conad and the Coop (pronounced "cope"), or--for heavy-duty shopping--to the Panorama hypermarket just outside the mainland port and industrial zone of Marghera, which is served by a free coach from Venice that operates throughout the day. Panorama is a "big box" store that could be loosely compared to a Wal-Mart or Target Greatland in the United States. (The Panorama chain has 23 stores in the Veneto and neighboring regions of Northern Italy). In addition to the Panorama hypermarket, the Panorama shopping center in Marghera houses an In's discount grocery store (similar to Aldi), a Benetton outlet (Benetton's corporate headquarters are in nearby Treviso), a SME appliance and electronics store (where Cheryl was impressed by the largest display of steam irons that she'd ever seen), and several other retailers. 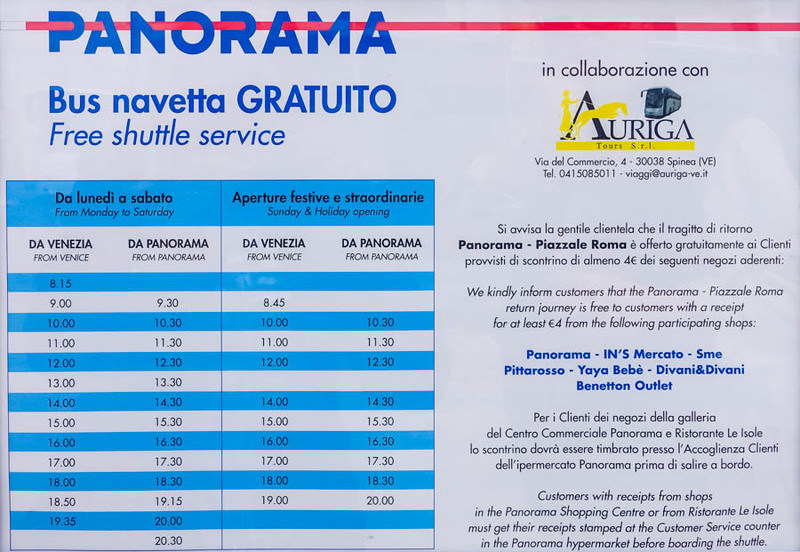 Most tourists needn't bother to visit Panorama, but if you're in Venice for weeks or even months, you may find it worthwhile to catch the free shoppers' bus from the Piazzale Roma. You'll save money on basics like pasta and toilet paper, and you'll get to see how ordinary Venetians spend the money that they've earned from rowing gondolas, selling masks, making pizza, or teaching Italian to foreigners. The Panorama bus leaves from Piazzale Roma, the large square where buses, cars, and taxis drop off and pick up passengers at the edge of Venice's historic center. As this post's last update in spring, 2016, the bus ran seven days a week (sometimes with a smaller van rather than a full-size coach). ABOVE: In this photo, a Panorama bus has just arrived at the Piazzale Roma in Venice, and shoppers are removing their purchases from the luggage compartment. ABOVE: In theory, passengers are supposed to offer proof that they've spent at least four euros at the Panorama center when boarding the bus for the return trip. In practice, the rule is seldom enforced, so this heavy-duty shopper didn't need to show the driver her wad of receipts. ABOVE: Buses and trams (T1, change to T2) also run from Piazzale Roma to Panorama. But why buy a transit ticket when you can travel for free in a luxury coach? ABOVE: The windows of Spizzico and Burger King are papered over, and their signs are gone from this building in the Campo San Luca. For years, the large building with arched windows on the Campo San Luca has been shared by Spizzico (an Italian pizza chain owned by Autogrill) and Burger King. Before that, its tenants included McDonald's and another hamburger chain. On Thursday, we were suprised to see that the Burger King and Spizzico signs were gone, and the windows were papered over. Two small signs on the doors that advertised "400 seats available upstairs" were the only reminders that the premises housed Venice's largest fast-food restaurant until recently. Venetophiles tend to be snobbish about fast food, but we think it's unfortunate that Spizzico and Burger King are gone. In the handful of times that we stopped in (usually after arriving on a transatlantic flight when we were too tired to go anywhere else), we saw a clientele that ranged from teenagers to hotel workers to military cadets on tight budgets. With 400 seats upstairs and free restrooms for customers, Spizzico and Burger King offered a place where locals and tourists could eat cheaply, rest their feet for a few minutes, and use a toilet without paying the outrageous €1,50 charged by Venice's municipally-operated facilities. We hope the restaurant's premises haven't been leased by a clothing retailer (Venice already has more than enough of those), but we're not optimistic. After all, Benetton is taking over the city's main post office, so it wouldn't be surprising to see a Banana Republic or a Jack Wolfskin occupying the former Spizzico and Burger King.